The federal and provincial and territorial governments are all responsible for the judicial system in Canada. What do the federal courts do? The Supreme Court of Canada is Canada's final court of appeal. Its nine judges represent the four major regions of the country. Three of them must be from Quebec, to adequately represent the civil law system. The Supreme Court has two main functions. It hears appeals from decisions of the appeal courts in all the provinces and territories, as well as from the Federal Court of Appeal. Supreme Court judgments are final. It decides important questions about the Constitution and controversial or complicated areas of private and public law. The government can also ask the Supreme Court for its opinion on important legal questions. The federal government also established the Federal Court, the Tax Court and the Federal Court of Appeal. The Federal Court specializes in areas such as intellectual property, maritime law, federal–provincial disputes, and civil cases related to terrorism. The Tax Court specializes in hearing appeals from tax assessments. The Federal Court of Appeal reviews the decisions of both these courts. In fact, it is the highest court of the land for about 95 percent of all cases. The court system is roughly the same across Canada. 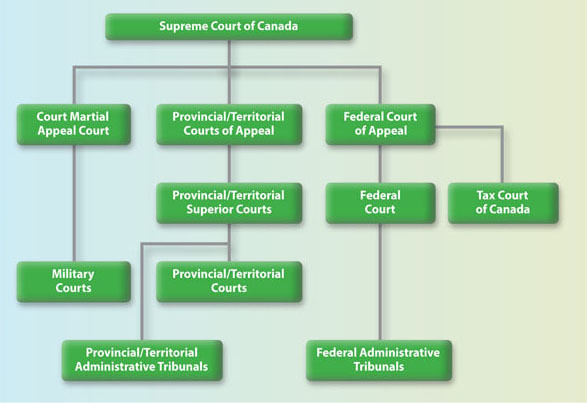 Except for Nunavut, each province has three levels: provincial and territorial, or lower, courts; superior courts; and appeal courts. The Nunavut Court of Justice has a single-level trial court. Provincial courts try most criminal offences, money matters and family matters. In private-law cases involving breach of contract or other claims of harm, the courts apply common-law principles in nine provinces and the territories. In Quebec, courts apply the Quebec Civil Code. Provincial courts may also include specialized courts, such as youth courts, family courts, and small claims courts. Each provincial government appoints the judges for its own courts. Superior courts are the highest level of courts in a province or territory. They deal with the most serious criminal and civil cases and have the power to review the decisions of the provincial and territorial courts. Superior courts are divided into two levels: trial level and appeal level. The trial-level courts hear civil and criminal cases. They may be called the Supreme Court, the Court of Queen's Bench, or the Superior Court of Justice. The appeal-level courts, or Courts of Appeal, hear civil and criminal appeals from the superior trial courts listed above. Although the provinces and territories administer superior courts, the federal government appoints and pays the judges. There are other kinds of disputes that do not need to be dealt with in the courts. Different kinds of administrative tribunals and boards deal with disputes over the interpretation and application of laws and regulations, such as entitlement to employment insurance or disability benefits, refugee claims, and human rights. Administrative tribunals are less formal than courts and are not part of the court system. However, they play an essential role in resolving disputes in Canadian society. Decisions of administrative tribunals may be reviewed in court to ensure that tribunals act fairly and according to the law.